Bullring and "La Malagueta" beach. Enjoying a privileged geographical position, the coastal area is protected from the North winds by the mountains ensuring the highest average temperatures in Spain and over 300 days of sunshine per year. 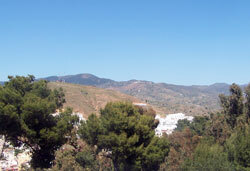 While along its rugged eastern part rocky projections of land penetrate the sea, the western area is milder and sandier with large beaches making it one of the most developed areas of Andalusia due to its demographic and tourist appeal. Málaga became a popular winter resort for the wealthy during the 19th century and was famed for is elegance and sophistication. The beautiful park on Calle Alameda dates back to this era and is one of the most celebrated botanical collections in Europe. Open air concerts are held here every Sunday during winter, making a refreshing change from the beach scenario on the coast. Pablo Picasso is the City’s most famous son (not counting Antonio Banderas of course!) and there are several galleries showcasing his work, including the 16th century Museum of Fine Arts next to the Cathedral. His birthplace in Plaza Merced, an official heritage site since 1983, is open to the public and is an archive of his life and works. Museo Picasso Málaga is a moving experience of Picasso’s lifetime of works and has become one of Málaga’s prime attractions. The museum is located in an old palace converted into an amazing art experience. Very natural and authentic, the loved and precision of the craftsmen is evident in the doors and the roof paying tribute to their fellow country man and eminent artist. The permanent collection is composed of donations from his grandson and wife. Even in Picasso’s early paintings is demonstrated a quality of brush stroke and amazing maturity of composition at age 16. There was never a painter like him before and nothing like him after. Seeing the works concentrated here gives an even greater respect for one of the greatest men of the 20th Century. Museo Carmen Thyssen, and Art Gallery composed from the Carmen Thyssen-Bornemisza Collection, was inaugurated on the 24th of March 2011. 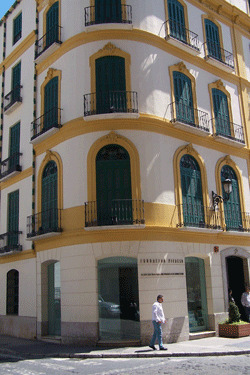 This art gallery comprises of 2677 works from the Carmen Thyssen-Bornemisza collection and makes a complete run through the different genres of Spanish Painters of the 19th century, a painting era defined chronologically between Francisco de Goya and Pablo Picasso, giving particular emphasis on Andalusian art. Teatro Cervantes is Málaga’s main theatre where Antonio Banderas once trod the boards and he still visits. As well as being a cultural capital, Málaga is a great place to eat out. The Malagueños love their food, and the bars and restaurants are where the real social life takes place. The choice is limitless and reasonably priced with some bars offering a menu of the day with wine for as little as 6 Euros. Tapas, small portions of many different dishes, are an Andalusian tradition and a wonderfully inexpensive way to try a variety of local foods. 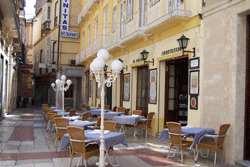 Málaga is famous for its “pescaito frito”, an assortment of small fried fish including sardines and anchovies, best followed by a glass of ice cold vino at one of the many old fashioned bodegas in town. But if you want that absolute “catch of the day” freshness El Palo, a typical fisherman’s village just to the east, is the place to go. 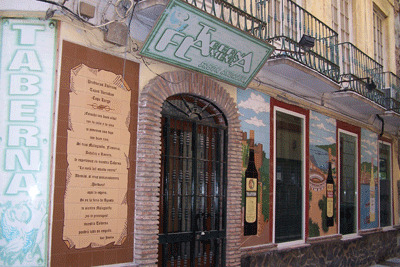 At Málaga’s oldest tapas bar “Antigua Casa de la Guardia”, try a tapas and glass of Málaga wine. Find no. 16 on the north side of Alameda Principal. Málaga closes for the siesta period, so this is a perfect time for a long relaxing lunch. Málaga boasts one of the highest concentrations of world class golf courses and is often nicknamed “The Costa del Golf”. Aside from the beaches, for families there are theme parks, water parks, safari parks, go-karting and many beautiful public gardens. Young visitors can enjoy Benalmadena’s Puerto Marina & ‘24 hour square’ and Marbella’s Puerto Banus, both very trendy and chic but be warned the bars and clubs don’t fill up until near midnight and stay open till dawn. 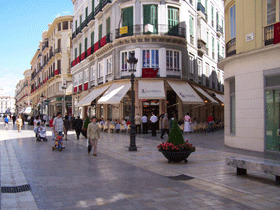 These days, Málaga prides itself on being a modern city with Calle Larios being the heart of commerce and considered the local Bond Street equivalent. This is the ideal location to start exploring the city being surrounded by attractive small streets, plazas as well as the magnificent cathedral. This renaissance Cathedral has a Baroque façade and choir by Pedro de Mena and offers daily guided tours. Garden lovers won’t be disappointed either with the beautiful Alameda Gardens and just outside the city on the way to Antequera one can discover the extensive botanical collection of Jardines de la Concepcion. 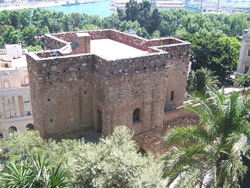 Since 2007, Málaga has entered an economic crisis driven by the global economic crisis. Nevertheless, the city is committed to improve the touristic quality that the city offers its visitors and encourage the growth that businesses with new technologies in “el parque tecnológico de Málaga” are experiencing, giving Málaga good growth prospects. As Málaga is one of the Spanish Capitals with the best climate and terrain for everyday bicycle use, Málaga’s city council is creating the cycle-lane infrastructure necessary to promote the bicycle as a form of transport within the city. Click here to see the map of the currently established cycle routes. Don’t forget, if you need anything related to cycling from MTB to road cycling visit this online bike shop which is located in Málaga. Málaga airport is one of the major airports in Spain due to the number of tourist arrivals on charter flights from Northern Europe using Málaga airport as a gateway to the Costa del Sol. If you are flying into Málaga airport you can pre-book a private Málaga airport transfer taxi or minibus to destinations throughout the province of Málaga: Marbella, Puerto Banus and Nerja. In recent years, Malaga has promoted the improvement and expansion of hotels in the city and has already managed to place Malaga amongst the Spanish cities with the best hotels on offer, including the recent opening of a 5 star hotel. The best hotels in Malaga can be found in the city centre and adjacent neighbourhoods.